Looking at some old texts (from the 1930s, mostly) I came across a type of sequence that was once part of the standard curriculum along side the familiar arithmetic and geometric varieties. As far as I know, this third sequence type, harmonic sequences, is no longer part of any standard high school curriculum (please correct me if I am wrong). Harmonic sequences have the defining property that the reciprocals of their terms have a common difference (i.e. their reciprocals form an arithmetic sequence). What might be surprising at first is that if you have two numbers, say a and c, then the harmonic, geometric and arithmetic means of a and c form a geometric series (or put another way, the geometric mean of a and c is also the geometric mean of the harmonic and arithmetic means of a and c). The algebra textbooks that I looked at did not present any applications of harmonic means or sequences (the exercises were restricted to formula manipulation), and the harmonic sequence does not seem to provide a very applicable 'model of growth', which is how the other sequences are generally presented. 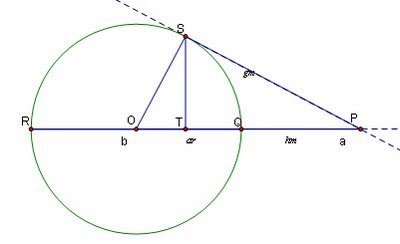 Harmonic relationships come up frequently in geometry, however, and one text did feature a nice construction for all three means (see below). Is zero a triangular number?